← VOTE, VOTE, VOTE for David against Goliath! Just look at this Orange Trumpet Creeper – sometimes known as the Flame Vine (Botanic name: Pyrostegia Venusta; pyro = flame, stege = covering, venusta = pleasing). 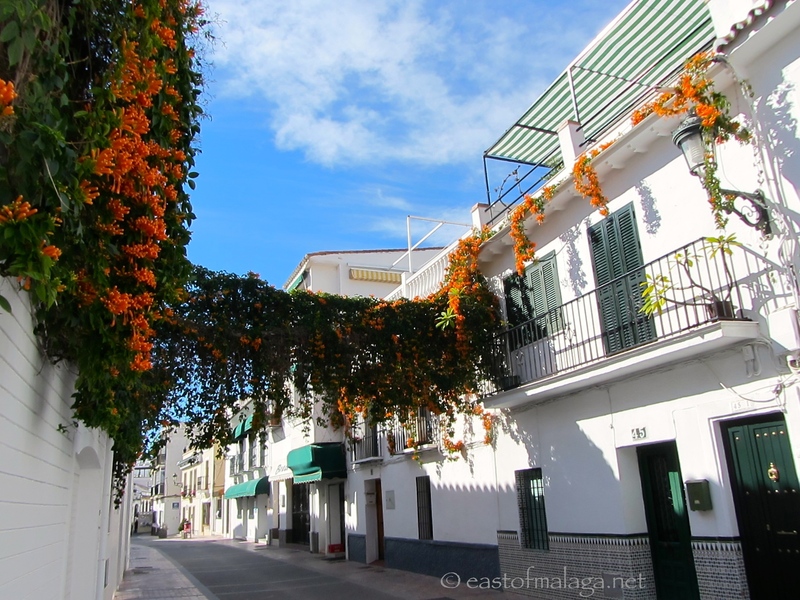 This particular magnificent flowering vine with it’s brilliant orange flowers can be found draped across Calle Carabeo in Nerja. The Orange Trumpet Creeper is a vigorous evergreen climber which grows well in a warm climate, needing shelter from cold winds or frost. As I wandered around Nerja in the warm sunshine, I discovered several examples of this spectacular plant. You can see them in the gallery below. I see these beautiful blooms every year, though for some reason haven’t stopped to take photos and really enjoy their beauty, before. My new challenge: One Trip EVERY Month gave me the perfect opportunity to get out and about with my camera. Tell me where you are going this month that you’ve never got around to visiting before. This entry was tagged Andalucía, East of Malaga, Europe, flowers, garden, gardening, gardens, Malaga, Nerja, One trip EVERY month, One trip EVERY month Challenge, photography, Spain, weather, white villages. Bookmark the permalink. What is the Spanish name for this plant? I’m afraid I don’t know, Rob – but if you use the Botanic name: Pyrostegia Venusta – then I’m sure you will find it at a garden centre. Yes, they are! 🙂 I love them. That link is fine Gilly – I haven’t written up my trip for this month yet. Titchfield Haven looks like the perfect place for respite from the UK storms. oh my gosh, just look at all that ORANGE!! so beautiful! and such lovely photos. I am going to “cheat” for this month’s trip. It’s not a place I’ve never gone, rather a place I try to get to during the cold winter months and we’re leaving shortly! So, I haven’t been in a year. I do have one other museum in mind that I’d like to go back to, haven’t been in probably 20 years. and since there seems to be no end in sight to our frigid weather, perhaps we’ll do that next weekend. a ver….if we go, I will just do another post if it’s alright with you 😉 Thanks for sharing such loveliness with the orange flowers. wow…. There are no rules with the “One Trip EVERY Month” challenge, really Toby, other than it has to be new trip – not one you did two years ago and now want to write about. It really doesn’t have to be anywhere new – that was just a suggestion. The main thing is to actually do a trip! Beautiful. Do you know how long they flower for? The wonderful news is that this magnificent spectacle lasts for around two months. Cracking quality pictures as always. Btw what camera are you using. Thanks Irving – I really appreciate you saying that. Just beautiful! I have never seen this kind of flowering plant before. Does it have a scent? When is it in bloom? No apparent scent, Nicole – and it’s in bloom right now, in Spain! Oh so jealous. It is covered in snow here no. No color or flowers for months! Such a spectacular creeper, Marianne. We also get this in South Africa. Takes my breath away, Marianne! Beautiful, keep meaning to plant this in our garden in Spain as I know it will be happy there! Love, love these! Used to have it all over my garden wall in my last house! I bet that was a sight for sore eyes, Linda. It’s so vibrant and bursting with life, isn’t it? Lovely – a real winter warmer. Thank you for this! Where I am right now, I find it hard to believe that anything is flowering anywhere! Fantastic plant, even looking at it gives a feeling of warmth to come. Great photographs thank you. Brighten up a dull day…. My word! Those really are stunning! Wonderful , dripping with heat and passion! The Orange Trumpet Creeper look like waterfalls of flowers, Marianne. They hang carefree creating beautiful cascades. The orange color against the white of the homes is sunny and bright. Yes, they DO look like waterfalls of bright orange flowers, Izzy. They truly are a sight to behold!